As I navigate the shoals of Emmy awards campaigns — with stacks of upcoming “FYC” events for Television Academy members, from Showtime’s “Ray Donovan” to CBS’s “The Late Late Show with James Corden” —I am stymied by the size of the Emmy voting bloc. Somehow, 6,000 Academy of Motion Picture Arts & Sciences voters are global yet scalable—Oscar experts know exactly how many live in London, New York, Los Angeles, San Francisco and Santa Barbara, and even which ones vacation in Aspen and Sun Valley every Christmas. 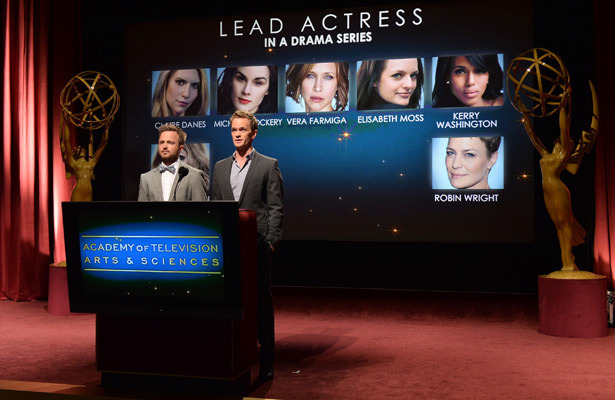 For one thing, most ATAS voters for the Primetime Emmy Awards are based in Southern California or New York. While the Oscar has members from 17 branches all over the world nominating 24 categories, ATAS has 29 “peer groups” (listed below) whose members can nominate nationally televised shows and commercials, from publicists, executives, and “performers” (like the Motion Picture Academy’s Actors branch, the biggest group), to makeup and hair stylists, animators, casting directors, designers, editors, writers, and cinematographers. (Unlike AMPAS, “professional representatives” and stunts people are included; agents and managers can only vote for the top TV categories.) Seventy percent of Emmy members are below the line. With ATAS, you can apply online: if you fulfill your minimum credits and stay active with two recommendations (which you don’t need if you’ve been nominated in the last four years), you’re in within four to six weeks. Until recently, AMPAS allowed membership for life; those rules are being rejiggered in an attempt to make the organization more relevant. Despite attempts to broaden the voting base (the entire TV Academy now can vote for the outstanding program winners), the same top shows seem to repeat year after year—they’re the most popular, the ones that everyone sees. Which is why the ante is so high for publicists, who must grab as much attention as possible for shows on the cusp that want to get noticed. As awards campaigners will tell you, it’s about getting seen, and moving to the top of the screener pile. ATAS is not to be confused with The National Academy of Television Arts & Sciences (NATAS), which is based in New York and handles daytime (including soap operas), news and sports Emmys, plus local Emmy awards in major markets except Los Angeles. Both organizations (which split acrimoniously in the 1970s) jointly “own” the Emmy Award. Both film and TV organizations have a Board of Governors of similar size. While the Motion Picture Academy’s board is comprised of three reps from 17 branches —51—plus three governors-at-large recently tacked on to add diversity (Jennifer Yuh Nelson brings the ranks of women on the board to 18), the TV board has two reps for 29 peer groups, or 58, with 19 women. One major difference is the telecast rights for the Oscars vs. the Emmys. ABC currently has the Academy Awards telecast exclusively locked through 2020 (and is said to be negotiating an extension). The network is believed to be paying $50 million a year for the rights. The Emmy telecast, on the other hand, is split four ways, between ABC, NBC, CBS and Fox (which all take turns broadcasting the show via a “wheel” arrangement). The Television Academy receives an annual $8.25 million license fee from the networks, but that deal is set to expire in 2018. ABC has this year’s rights; the “68th Primetime Emmy Awards” will be hosted by Jimmy Kimmel (who also hosted in 2012) and broadcast live from Microsoft Theater in Los Angeles on Sunday, September 18. Only two Emmy hosts in the last decade have also hosted the Oscars: two-timer Neil Patrick Harris (2009 and 2013) and talk show host Ellen DeGeneris (2005); the others range from SNL grads Andy Samberg (2015), Seth Meyers (2014) and Jimmy Fallon (2010) to Garry Shandling (2004) and Conan O’Brien (2006). Clearly, there’s a perception gap between the Emmys and the Oscars. The former awards show seems more conventional and mainstream, not as discerning, elite and highbrow as the latter. But as more film and TV people move back and forth between both worlds, will people care more about the Emmys and take them more seriously?